A number of Outlook users are unable to access their email messages, an issue that's persisted since this morning. "We're having a problem accessing email," a Service status message on Live.com reads. "You might not be able to see all your email messages." It's unclear how many customers are affected or what's behind the disruption. 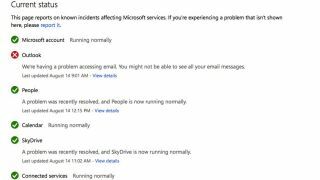 Earlier in the day, People and Skydrive also experienced interrupted service, according to ZDNet, though SkyDrive still appears shaky. Update: Microsoft said in a statement that Outlook.com experienced an incident that left some users unable to access their accounts or share SkyDrive files. Web access has been restored for all users, the company said, though issues may persist on mobile devices. Microsoft is working to restore full mobile access.